Compatibilization of Polymer Blends: Micro and Nano Scale Phase Morphologies, Interphase Characterization and Properties offers a comprehensive approach to the use of compatibilizers in polymer blends, examining both fundamental and advanced knowledge in the field. 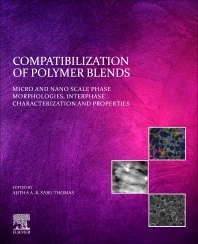 The book begins by introducing polymer blends, describing thermodynamics, miscibility, and phase separation, and explaining the main concepts of compatibilization. Other sections cover theoretical approaches for nearly compatible blends, incompatible blends, nanofillers, physical compatibilization, reactive compatibilization, morphological and structural characterization, and physico-mechanical characterization. Finally, key application areas are covered, including biomedical applications, packaging and automobile engineering. While this book will be a highly valuable reference source for academics, researchers and postgraduate students interested in polymer blends, it will also be ideal for anyone involved in the fields of polymer science, polymer chemistry, polymer physics, materials science, scientists, R&D professionals, and engineers in involved in the development or engineering of polymer products. Ajitha A R is a UGC Senior Research Fellow and Senior Research Scholar at the International and Interuniversity Centre for Nanosciences and Nanotechnology (IIUCNN), Mahatma Gandhi University, India. Her areas of interest are polymer blends, polymer physics and nanomaterials. She has been working in the area of polymer blend nanocomposites for 4 years. Her research areas include preparation of blends and nanocomposites and their applications. She has attended and presented several papers at conferences and seminars, and has contributed 3 book chapters.